Lilly Rivlin, a seventh generation Jerusalemite, has worked as a journalist, writer, and filmmaker for over 35 years. She is a consultant to foundations on Middle East politics, Jewish affairs, non-violent conflict resolution and gender issues and serves on the boards of a variety of feminist organizations. Lilly is one of a group of women who pushed the limits of Jewish tradition by creating new rituals including, most importantly, the Feminist Seder. On a cold winter’s day I trudged over to her warm studio apartment with its view of the Hudson River to talk with her about filmmaking as an activist activity. Sue Leonard: You are a filmmaker and a feminist. What does it mean to be a feminist filmmaker? Lilly Rivlin: Being a woman sets the course of my interests. Becoming a documentary maker gave me the context and the material to apply my determination and passion for politics to women’s stories. My co-producer has said that my films are “slices of history that are personal but also political.” I live by that motto. When first making films, I had an epiphany that my role in life is to record. SL: What got you into filmmaking? LR: I’ve known I was a storyteller since the fourth grade when we had an assignment to choose an image we liked and to tell a story. I loved it. My becoming a filmmaker was a matter of specific steps, some accidental, but I don’t believe anything is accidental. After graduate work in political science I moved to Jerusalem; at some point I began writing articles, then I filled in for a friend who was a stringer for an American publication. Naturally, I began taking photos, then I learned the skills of the darkroom, and all this came together after the Six Day War, when I followed a six-year-old boy through the Old City of Jerusalem with my camera and documented his reaction to Arabs (whom he had never met). This became the book When Will the Fighting Stop? Then I became the researcher for Larry Collins and Dominique Lapierre who wrote O Jerusalem about the siege of Jerusalem in 1947-48. In 1970 I moved to England where David Putnam, now Lord Putnam, and his partner Sandy Lieberson hired me to develop and write a 13-episode series on the history of the Jews. The series never materialized but it launched me into the world of filmmaking. SL: What was your own first film? LR: My first film was The Tribe. I was told there would be a reunion of my family in Jerusalem in 1981. I decided I had to film it. I brought a cameraman and an assistant from New York. My family had a tradition of recording the generations in print form, but I was the first woman to do it in film. Twenty-five hundred family members attended. The Rivlin history in Jerusalem goes back to 1806. In retrospect I see my modus operandi as starting from the personal and generalizing the story to something larger. In the case of The Tribe it was looking at my extended family through this reunion and placing it in the context of Ashkenazi history and its connection to Jerusalem. The film was screened at MOMA. That was a good start. SL: How many films have you made? LR: So far, I have made seven documentaries; they include Miriam’s Daughters Now  that documented early feminist rituals; Gimme a Kiss , an exploration of my parents’ problematic marriage; Can You Hear Me? , that began as a biblio-drama about Sarah and Hagar enacted by Palestinians and Israelis and then became a documentary about Israeli and Palestinian peace activists struggling to make peace; Grace Paley: Collected Shorts  which was about the writer/activist Grace Paley and incorporated her remarkable short stories into the story of her life; and now, Esther Broner: A Weave of Women. It’s been a long haul. SL: How do you make your films? How do you find your material? LR: I try to keep my budgets as low as I can. In my earlier films I shot with a Sony 2000 video camera; then the technology changed. So I hired others to shoot. I don’t edit so I hire an editor. My last two films were edited in my studio apartment. I hire interns from the NYU film school, whom I pay, to help me with typing transcripts, and research, which is quite extensive, time consuming, and logistically challenging. We brainstorm. We put out a wide net. I keep enormous notebooks of data, which need to be precise or we have problems later in the process. On my last three films I’ve had the invaluable Oscar-winning Margaret Murphy as my co-producer. She is a stickler for details, organization and story line. On the Esther Broner film I was helped by a long-time librarian who wanted to become a film researcher, so I made a deal: I would train her in exchange for her services. It worked. SL: Do you have to pay for footage? LR: Yes, I always need to get permission and to negotiate payment. SL: Many of your films are about people you love. How do you modulate between being a professional and deep friendships? LR: It’s hard work and I struggle a lot. When I say I’m making another film my friends moan because I share my struggles about the work with them. Not having children I now see that my films are my children in a way. But I always strive to tell the truth about my subjects, warts and all; I don’t like hagiographies. SL: Which films have been the most difficult to make? The film on Grace Paley is a moving compilation of her readings and her political actions – and her lovely self. After watching the film, I went back and reread her stories. LR: Filming the movie about Grace was hard because she was already sick when I started filming and I felt guilty bothering her for interviews. Grace could never say no to anyone, so I simply persisted. But I decided to make a film about Esther Broner during her last days, as she lay dying in the hospital. Hence, there were no comprehensive interviews with Esther. Without the wealth of anecdotes and personal stories one would have from the subject, I feared the project would be a difficult one. SL: How did you solve that problem? LR: Fortunately, there were Esther’s daughter, Nahama, and granddaughter, Alexandra, who had absorbed so much of Esther’s life history and told such moving stories about her. And of course there was Esther’s “weave of women,” the friends and colleagues with whom she had such a special bond, spiritually and intellectually, and who loved sharing a laugh. And then there were what I call the “little miracles” such as Sari Broner finding a wonderful still of Esther nursing her, or my researcher locating material of a younger Esther on a writers’ panel at the University of North Dakota. Or the miracle of having great footage of Esther and Nahama from a cable program I produced so early that I don’t remember the date. Or the miracle of finding a recording of Esther reading at the Women’s Salon that took place in Westbeth – where I live – and not long after, finding a photographer in the building who had taken stills of the event. The film documents the evolution of Jewish feminism through the Feminist Seder. We used archival footage and my interviews with leading Jewish feminists who attended the Seder such as Letty Cottin Pogrebin, Gloria Steinem and Canadian feminist/author Michele Landsberg. Still, why was it the most difficult of all my children? Perhaps, because I was too close to the subject matter. Esther was my dear friend. And those who had also been close to her were protective of her memory. I had to find an artistic balance in weaving her story with conveying the experience of the Seder to the viewer. It was a struggle to include everything that made these Seders so moving and unique, while also trying to show how Esther re-invented the ritual of the Seder from a woman’s perspective. (Again, the personal and the political!) Also, I was trying to make a film that would be understandable to a wider audience, not just a Jewish one. 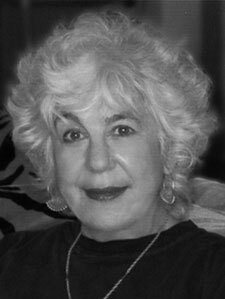 My greatest pleasure is that now a new generation is able to know Esther Broner in all her magical brilliance. The wondrous film, A Weave of Women, will be shown at the Jewish Community Center in New York City on March 24, at the Jacob Burns Center in Pleasantville, N.Y. on March 30, and soon at other venues. A DVD will be available shortly (look for an ad in our Arts Mart when it is ready for distribution). LR: I have found the right person through whom to tell the story of the women’s movement, civil rights, and other progressive issues. When I write it up, I will go to the usual suspects, my allies, to try to get funding before beginning to shoot. Obviously, I don’t want to say more. An award winning filmmaker, writer and political activist, Lilly Rivlin lives in New York City. She was born in Jerusalem and immigrated to the United States with her family in 1945. Rivlin did her graduate degree in Political Science at UC, Berkeley. Most recently she was selected as the 2013-14 recipient of the annual Miller Distinguished Jewish Woman Filmmaker Award. Rivlin is listed in Feminists Who Changed America, 1963-1975 (2007) and Jewish Women, A Comprehensive Historical Encyclopedia (2007). View More: Next piece "Girls Going Ape: Art As Activism", Home, Archive. Someone should make a documentary about Lilly Rivlin, she has led a life in which the world is in debt to her for her social activism and her unrelenting pursuit of social justice. Lilly is inspiring. Thanks for this very interesting interview reminding us of the remarquable Esther Broner! I knew Lily as a child in Washington, DC–she was a leader even then–so I am excited to see the fine career she has developed, especially since I too am a writer. Wow, I would LOVE to see these two films. Where can I find? What a lovely interview with a marvelous filmmaker, whose work is among the richest evocations of women’s creativity we have. Brava!! Thank you, Persimmon. Grace Paley and Essie Broner rightly star in Lilly Rivlin’s films, but you recognized the star in Rivlin herself. based in Chicago myself, I totally agree with you Lilly that many “little miracles” happen throughout the making of a documenatry, I just never gave it a name. I will be in New York in April and hope I get to see your latest doc A Weave of Women. Congratulations!